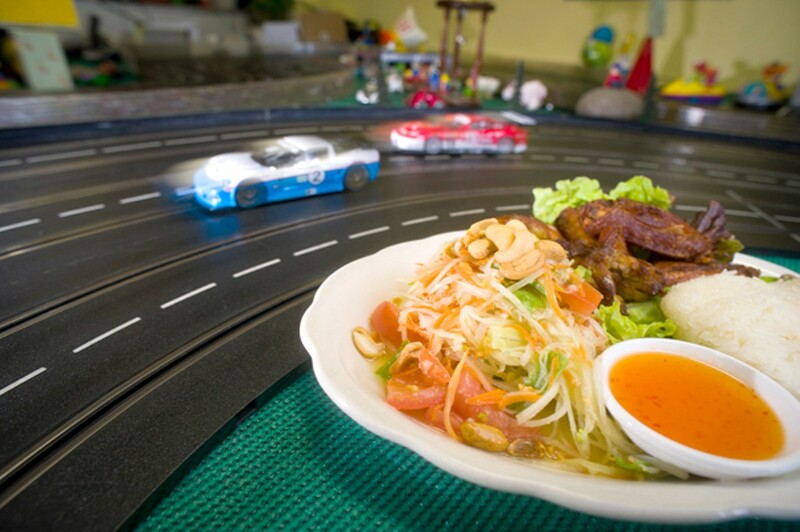 Come for the slot cars; stay for the khao tom. The papaya salad was notable for its freshness, but it lacked pungency. Hours: Wed.-Sun. 11:30 a.m.-10:30 p.m.
At Homeroom Racing Cafe, probably the most idiosyncratic Thai restaurant in Alameda, the soundtrack for your meal is a blend of smooth-jazz Muzak and the high-pitched whir of electric race cars. Vintage auto posters cover the walls, Star Wars model spacecraft and superhero action figures dangle from the ceiling, and the four or five TV monitors are always tuned in to something random — a nature show on manatees, during one of my visits. The overall vibe is more ten-year-old-boy's-basement-hideaway than restaurant, with a no-frills dining area that's little more than plastic-topped tables and folding chairs. Casual is an understatement. 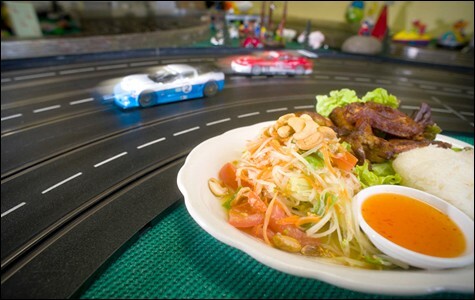 In truth, Homeroom Racing Cafe is a dual storefront of sorts: kids and hobbyists gravitating toward the impressive miniaturized Grand Prix race track that fills the back room; diners digging into chef Arista Saengchan's home-style Thai cooking up front. Saengchan co-owns the restaurant with her husband, Harry Velez, who conceded that race cars and Thai food aren't exactly a classic combo. According to Velez, they'd gotten the idea to open the restaurant at their current Park Street location seven years ago, but were stuck in limbo while the landlord did construction on the building. Unable to install a kitchen, Velez got it in his head to set up a slot car race track — a hobby he'd picked up in his retirement years — as a sort of side business. So was born Homeroom Racing Cafe, a purveyor of wholesome fun that for a time boasted the "largest, longest standing Carrera track in the United States." And for nearly five years, the track formed the entirety of the business. Velez and Saengchan set up shop across town, on Webster Street, for a while, but moved back in 2009 when their kitchen was ready. And while they've experimented with rebranding the restaurant portion of their business under a different name — House Royale Cuisine (also HRC; get it?) — everyone knows the place as Homeroom Racing Cafe. Anyway, we're here to talk about the food. Saengchan serves what she describes as "country-style" Thai cooking — heavy on the fresh herbs and aromatics. So during one visit, we ordered a combination plate that included fried chicken wings, papaya salad, and sticky rice. The sticky rice was okay (a little hard, actually), and the lemongrass-and-turmeric-marinated wings were tasty (crisp and served piping hot). But the winner was the papaya salad: for the freshness of the green papaya and carrot shreds, the brightness of the flavors. Mind you, there wasn't the punch-in-the-face pungency and spiciness that you get at some of the more aggressively authentic Thai places. Saengchan is pretty restrained in her use of fish sauce and shrimp paste, but the spice levels are adjustable. If you like more heat, ask for "Thai spicy." Meanwhile, HRC's Tom Yum Noodle Soup, the classic hot-and-sour soup, does pack a fiery punch, which is balanced by the earthiness of fried garlic and a lovely hit of acid from Kaffir lime. Topped with ground chicken, this was a substantial bowl of soup — flawless except for the fact that there were way too many noodles, which became mushy after they'd absorbed much of the liquid. None of Saengchan's food is especially fancy. In fact, most of the dishes on the menu are standards you'll find at any Americanized Thai eatery: pad Thai, chicken satay, a variety of curries with mix-and-match proteins. HRC's bread-and-butter is well-executed and accessible Thai food — it isn't the kind of place to go looking for obscure regional items. Still, there are pleasant surprises. During one visit, I asked our server if there were any items that weren't listed on the regular menu. She recommended the rice soup, which she described as "sick person's food." This turned out to be a variation on khao tom, a popular breakfast dish in Thailand. There isn't so much rice, and it isn't cooked so long that you end up with porridge. Instead, HRC's version is a rich and super-herbaceous — cilantro lovers only, please — chicken soup, with tender bits of shredded chicken and the individual grains of rice still intact on the bottom of the bowl. Delicious. On another occasion, I ordered the spicy Thai-style burger, listed only on a signboard by the door. This came with grilled onions, lettuce, and tomato, all piled on top of a generic supermarket sesame bun that wasn't toasted — and ended up soggy as a result. An accompanying side of fries was your run-of-the-mill frozen potato wedge variety. But the beef patty itself was fascinating, loaded with chopped-up "stuff": green beans, basil, chili peppers. Burger purists beware, this came cooked well-done and had the chewy texture (and the heat) of a spicy Italian sausage patty — the kind of "burger" I could imagine getting off the grill at some Thai-American family's backyard barbecue. By most normal measures, it was a terrible burger. Then again, I couldn't stop eating it. Finally, I'd be remiss not to mention how much fun the slot car racing is. Who knew? Five bucks bought me fifteen minutes with a sleek red-and-white number, which I lined up in the outside lane — the most difficult lane, I'd like to point out, which was the only reason I caused those three-car pile-ups. The group of eight-year-olds I was racing — regular customers, I gathered — were nice about it, though. It turns out you can rent out the entire back room for parties, and kids (and grownups) can even eat their pad Thai trackside if they so choose. As we headed home, the whir of tiny battery-powered engines still ringing in our ears, one of my dining companions observed that the food was good, but that it seemed like this restaurant was more about "the scene."